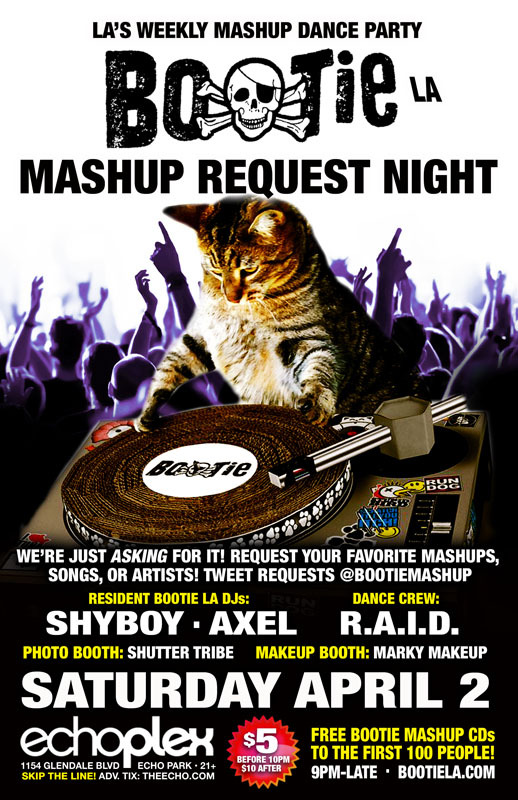 Los Angeles Bootie LA: Request Night! Bootie DJs do their best to mash up your requests! Bootie is just ASKING for it! It’s Mashup Request Night! Request your favorite mashups, artists, or songs, and DJs ShyBoy and Axel will do their best to mash them up! Resident dance crew R.A.I.D. keeps your energy up with their go-go insanity, Marky Makeup gives your face a glamorous touch, and Shutter Tribe captures it all! Plus FREE Bootie mashup CDs to the first 100 people through the door! Launched in 2003 by San Francisco DJ duo A Plus D, Bootie was the first club night dedicated solely to the then-new bootleg mashup — and is now the biggest mashup event in the world, with regular parties in several cities across the globe. Winning various nightlife awards for the past 12 years, Bootie celebrates pop culture both past and present, keeping your brain guessing and body dancing with creative song combinations that provide the soundtrack for the A.D.D. generation.